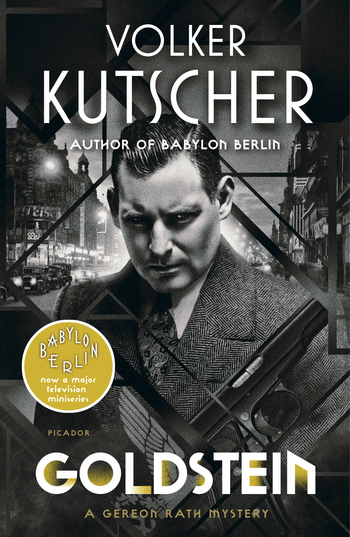 Volker Kutscher, author of the international bestseller Babylon Berlin, continues his Gereon Rath Mystery series with Goldstein as a police inspector investigates the crime and corruption of a decadent 1930s Berlin in the shadows of the growing Nazi movement. Berlin, 1931. A power struggle is taking place in Berlin's underworld. The American gangster Abraham Goldstein is in residence at the Hotel Excelsior. As a favour to the FBI, the police put him under surveillance with Detective Gereon Rath on the job. As Rath grows bored and takes on a private case for his seedy pal Johann Marlow, he soon finds himself in the middle of a Berlin street war. Meanwhile Rath's on-off girlfriend, Charly, lets a young woman she is interrogating escape, and soon her investigations cross Rath's from the other side. Berlin is a divided city where two worlds are about to collide: the world of the American gangster and the expanding world of Nazism. VOLKER KUTSCHER was born in 1962. He studied German, philosophy, and history, and worked as a newspaper editor prior to writing his first detective novel. Babylon Berlin, the start of an award-winning series of novels to feature Gereon Rath and his exploits in late Weimar Republic Berlin, was an instant hit in Germany. The series was awarded the Berlin Krimi-Fuchs Crime Writers Prize in 2011 and has sold more than one million copies worldwide and was adapted as a 12-part Netflix miniseries by Tom Tykwer (director of Cloud Atlas and The International). He lives in Cologne. NIALL SELLAR was born in Edinburgh in 1984. He studied German and translation studies in Dublin, Konstanz and Edinburgh, and has worked variously as a translator, teacher, and reader. In addition to translation work, he currently teaches modern foreign languages in Harrow. He lives in London.